Key Takeaway: Russia resumed its air campaign against Aleppo City on November 15 after a nearly month-long pause on strikes in the besieged city. The operations included sorties launched from the newly-arrived Russian aircraft carrier ‘Admiral Kuznetsov’ and its accompanying battlegroup in order to showcase the military strength and power projection capabilities of the Russian Armed Forces. Russia also announced the deployment of up to seven additional S-300 anti-aircraft systems to Syria in order to reinforce its existing air defense network. Russia aims to advance its short-term goal to force the surrender of the opposition in Aleppo City while setting conditions to constrain the options of the U.S. in Syria in the long-term. Russia launched a new intensive air campaign throughout Northern Syria on 15 NOV in order to showcase the capabilities of its newly-deployed air and naval units. Russian Minister of Defense Sergey Shoygu announced the start of a “major operation” targeting positions allegedly held by ISIS and Al-Qaeda in Idlib and Homs Provinces. Activist reports indicated that Russia resumed airstrikes against opposition-held districts of Aleppo City, breaking a nearly month-long moratorium on strikes in the city. Russian Ministry of Defense Spokesperson Maj. Gen. Igor Konashenkov denied the reports as “public rhetoric” and “blatant lies” from the U.S. State Department. Russia also reportedly intensified its wider air campaign against core opposition terrain in Aleppo and Idlib Provinces. Despite Shoygu’s earlier statements that Russian forces would target positions in Homs province, activists did not report any intensified air operations. Russia launched combat sorties from the newly-arrived Russian aircraft carrier ‘Admiral Kuznetsov’ based in the eastern Mediterranean Sea, marking the first such use of an aircraft carrier in combat by Russia. The Russian Frigate ‘Admiral Grigorovich’ conducted cruise missile strikes from the Mediterranean Sea in support of the offensive. Russia also claimed that Bastion-P Anti-Ship Missiles were fired against ground targets in Syria in a show of land attack capability. 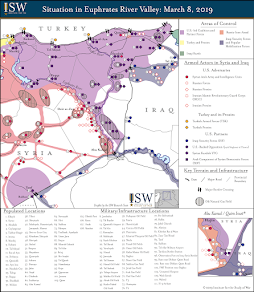 These developments support ISW’s forecast at the start of the month that Russia would escalate its air campaign against Aleppo City and Damascus over the near-term in order to tout its standing as a great power, reinforce its claims to be a credible partner against violent extremism, and reinvigorate domestic support for its continued participation in the Syrian Civil War. Meanwhile, Russia continued to strengthen its regional air defense capabilities in order to set long-term conditions to maintain its de-facto no-fly zone over much of Syrian airspace. Russia has built up a de-facto no-fly zone in northern Syria using a combination of S-400, S-300 and shorter range (Buk, Pantsir) air defense missile systems. The newly deployed S-300V4 systems will provide additional coverage for Russian naval units and build further redundancy into its integrated air defense system (IADS). Russia will likely attempt to achieve its short-term aim to clear opposition forces from Eastern Aleppo City while positioning itself to maintain its long-term influence amidst a new incoming administration in the U.S.
Russia will leverage the asymmetric advantage of its air and naval assets in an attempt to force the surrender of besieged districts in Aleppo City, defeat the acceptable opposition in Northwestern Syria, and precipitate the transformation of the opposition into a movement dominated by Salafi-jihadist groups. The successful bombardment of Aleppo by Russian air and naval units is meant to bolster Russian domestic support for the intervention and President Vladimir Putin’s regime. Strengthening Russian IADS by deploying redundant systems will further constrain U.S. options for engagement in Syria. Russia aims to exploit the radicalization of the opposition to legitimize its continued intervention in Syria and create leverage to negotiate a military partnership with the incoming U.S. administration. A military partnership along Russia’s terms would significantly confine U.S. action in Syria and allow Russia to consolidate its position of regional influence at the expense of U.S. national security interests. 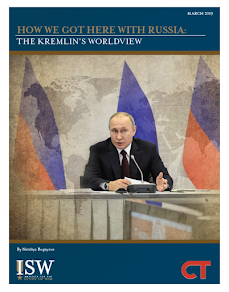 “Warning Update: Russia Prepares to Escalate Military Intervention in Syria,” Jonathan Mautner et al.